Location: Central Schuyler County, at the intersection of Main and Genesee Streets in the Village of Montour Falls. Starting from the intersection of Routes 14 and 224 in the Village of Montour Falls, proceed south on Route 14 for one block to Main Street and turn right (west). In about 0.3 of a mile turn left (south) onto Genesee Street and immediately find a place to park along the west side of Genesee Street, near the entrance to a small park. 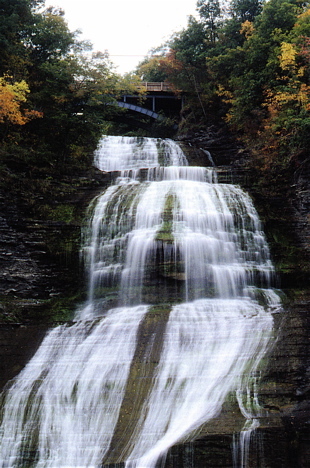 This magnificent waterfall, which faces to the north-northeast, is 156 feet in height, and has a 36 foot wide crest. The waters of Shequaga Creek tumble down the cliff in an attractive mixture of vertical falls and extremely steep cascades. The width of the falls gradually increasing as the tumbling waters make their decent. It is a fantastic sight any time of the year but is outstanding during the spring thaw. According to local legend, Red Jacket, a Seneca Indian Chief known as a skilled public speaker, would often come to the falls, not only to enjoy their beauty, but also to train his voice against the sound of the falling water. 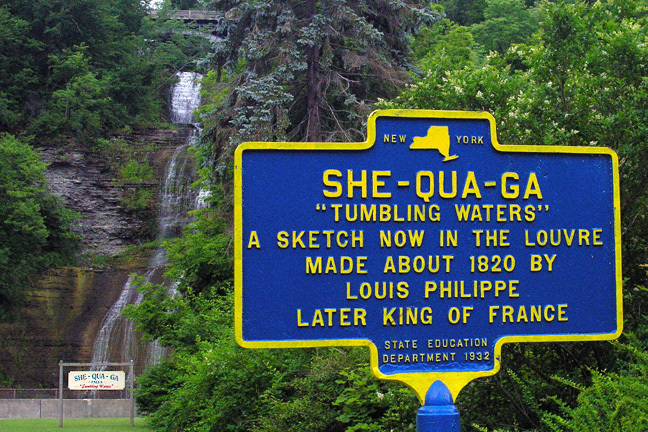 The Village of Montour Falls is sometimes called the "Valley of Tumbling Waters" because of the numerous waterfalls surrounding the village.